My current landlord emailed me at the end of May asking what my plans were since he had only one rent check left. I was planning on moving to a smaller place in the same area where we currently live. When I got his message, it made me a little anxious. I thought I'd be excited about moving soon. Instead I was nervous. I really hate moving. Always have. But maybe that's because I've always had so many things to move, which made it all that much more stressful. A fantastic opportunity came up. The man I rent my parking spot from for work has a condo for rent in that building. So, I'm going for it! I signed the lease! I'm going to be an urbanite! We will be moving there mid September. I will have a 5-minute walk commute to work (which is already part of my commute). I'll be within walking distance of that café I wrote about in a previous essay. This is so exciting! For years I've wasted so much time stuck in traffic. No more daily traffic for me! Everything I need will be within walking distance. Food, entertainment, culture, work. Walking everywhere will also give me the exercise I've been lacking. I'll be moving from a home that's approximately 1700 square feet to a condo that's about 875 square feet. I have mixed feelings of nervousness and excitement. My mother came to visit the place with me. According to her, it's very small. In my opinion, it's more than enough room for my daughter and I. But I must admit that my mom's concerns had me questioning my own feelings about the place. Is it a good move? Will we be comfortable? Will we be happy in a smaller space? I have about a month and a half to prepare for the move. I'm so happy I started my journey to simplicity at the beginning of the year! I hope the work I've done will make this moving experience the best I've ever had! 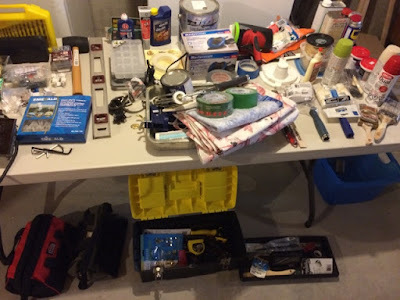 As I was thinking about preparing for the move, I realized that it's basically the contents of my room, of my daughter's room, and of the kitchen and bathroom. I sold my dining room and living room furniture. As for the rest of my belongings, I'll be packing up only what I really want to keep and bring. The rest will either be donated or tossed. I grew up in a small neighbourhood. I liked it as a child. I had many friends on our street. But as a teen and then as an adult, I never really liked the suburbs. It doesn't seem to fit me or the lifestyle I want. I've always chosen the suburbs because that's just what my family chose. It didn't really occur to me that I could choose something else. I mean it did... but it didn't. I just never questioned it. However, I've been questioning many things lately and it just so happens that this suburban lifestyle is one of them. This is all so strange to me! It's like I finally realize that I have a choice. Actually, I have many choices. For years I've been somewhat living on auto-pilot making decisions without considering all of the options. I'm still not considering them all, but I'm definitely open to other options that I would've never truly considered before. So moving downtown might be the right fit. I think the advantages for both my daughter and I outweigh any moving anxiety we might experience. Once we're settled into our new place, I'm sure we'll be happy with our decision. And if it turns out that I'm wrong, we can just move again. I think this is a great thing for you and your daughter. I moved from the city to a small town with a vibrant farming community and a university when my boys were little. I did so because I was a college student and it would cut down on driving and give me a bit more time. I was amazed at how much more time I had each day and the stress of rushing to get dinner done the moment I walked in the door was gone. I'd always preferred small town living but hadn't considered actually moving until my commute became a headache. As for the space. You may find that you can eliminate some of the stuff you currently have because it won't fit the lifestyle of being in the city with so much to do around you. In the suburbs we need to fill hours with hobbies and activities we could fill in other ways in a city. Children too need less when there is more happening around them. As for the actual space, I raised two boys in a home that was 840 sq ft and it felt spacious to us. We were outdoor type people and had lots to do outside so the square footage wasn't an issue. It's all what you make of it. Good luck with your move but most of all have fun and enjoy your new lifestyle. I am definitely on the same page as Lois here and I truly think this move will be a most positive one for you and your daughter! Plus, like you state...you could always move again if the experience proves to be less than positive. Take care and I look forward to reading more of your upcoming move and such. My daughter and I are really looking forward to the move! It feels like it can't come soon enough.